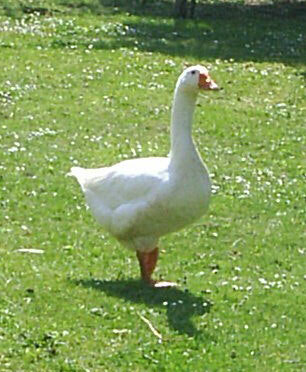 One of my farmingfriends forum members, Mama lives in France and has embden geese. 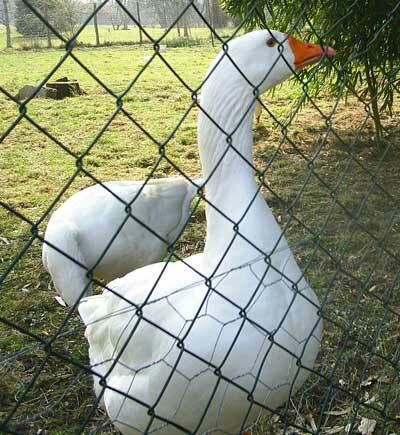 Mama has kindly sent in some photos of her geese so we can see what embden geese look like as another one of our members, Michael was not sure if his geese are embden. Here are Mama’s embden geese. Embden Geese - This is Sid and Sally! Embden Geese, Sid the Gander is in the middle! Mama is currently waiting for her two female geese to go broody as they have both been building nests and laying lots of goose eggs but still not sign of broodiness! Useful books for a new goose owner are Starting With Geese by Katie Thear and Ducks & Geese At Home by Michael Roberts. If you keep geese or are thinking of keeping geese then join the free farmingfriends geese forum for the latest chat, advice and questions about geese and geese related issues.